I have an issue on macOS Sierra (version 10.12.4), where Synergy crashes after the computer goes to sleep. Synergy version 1.8.8-stable-25a8cb2. Please provide details of both client and server machines. Specify which one is the server. Only the server crashes after sleep. Please try v1.9.0 from this thread. The issue happening, find error report attached. Is SSL turned on for both machines? Can you check this work around from GitHub? The SSL fingerprint on the server is blank, but on the client it has a value. I ran the one-liner and the file looks good, so it did not remove it. Have you checked step 2? Can you try connecting with SSL both turned off on each machine? Also, have you activated Synergy on your server? Can you try connecting with SSL both turned off on each machine? You can also view these steps from this knowledge base article. Apparently, I had to re-activate once I installed the 1.9 rc. After that I the SSL options was visible. I can confirm that the sleep issue only occurs using the SSL option. That is noted on this comment in a GitHub open issue. I'll add this scenario on that open issue. Are both machines updated to V1.9.0rc now? That is noted on this comment on a GitHub open issue. I'll add this scenario on that open issue. Are both machines updated to V1.9.0rc now? Yes, both machines are using the same V1.9.0rc. Does it prevent you from scrolling? Not at all, even though I do feel a subtle change on the scrolling effect on my client (Windows) as I mentioned on the github issue. 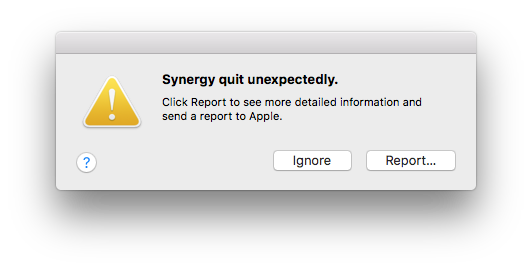 I must say that my client does not have the updated version of synergy. Would it be an option for you to update your client to v1.9.0?